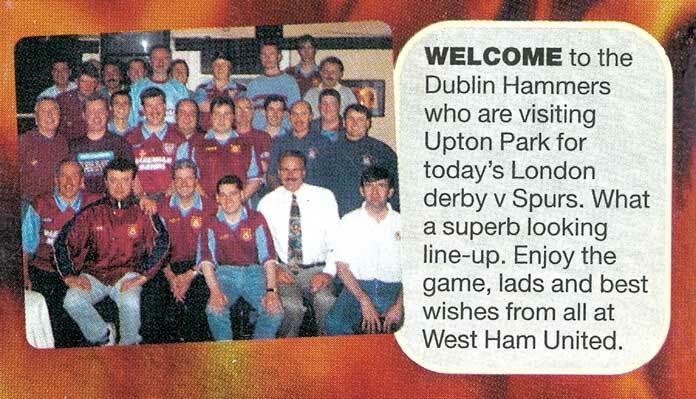 This photograph of Dublin Hammers members was published in the Club Programme for the match against Spurs on Saturday 28th Nov. 1998. West Ham were playing in the 'Premier League' and the line-up for the fixture included; Hislop, Pearce, Ruddock, Lampard, Ferdinand, Lomas, Sinclair, Berkovic, Hartson, Kitson and Keller. Sorry about the quality of this shot, anyone got the original? This photograph of Dublin Hammers members was published in the Club Programme for the match against Newcastle Utd on Sunday 21st Feb. 1993. West Ham were playing in the 'Barclays League Division One' and the line-up for the fixture included; Ludo, Breacker, Dicks, Potts, Gale, M.Allen, Mark Robson, Peter Butler (remember those two? ), Morley, Steve Jones and Kevin Keen.